Two brothers on the run in a wasteland stop at a roadside town where they confront a deranged group of criminal cannibals. Brothers Dominic and Miles Pierce go on the road in a desolate wasteland to avenge their father’s murder while scavenging for supplies and defending themselves from car thieves. After encountering a bloody woman who delivers a cryptic warning, the brothers stop in the nearly deserted town of Demyl looking for someone to treat Miles’ gunshot wound. Dominic strangles a man named Ivan who slashes his car’s front tire, but is forced to let Ivan go when a woman named Vijah threatens Dominic at gunpoint. Vijah treats Miles’ wounded hand and offers the brothers shelter. Vijah mentions a man named Doyle and warns Dominic not to explore the town, but Dominic goes looking for Ivan. Seduced by a woman named Sasha, Dominic is distracted and ends up assaulted by Doyle’s henchman Kane and Sasha’s boyfriend Latos. Latos confronts Vijah over hiding the brothers and forces her to tie up Miles. Latos then makes Miles watch as Doyle beats Dominic to death with a baseball bat. Miles is held captive and tormented by Doyle and his crew. Doyle chastises Vijah for taking an interest in helping Miles. Miles is forced to attend a cannibal dinner at a table with Doyle, Vijah, Latos, Sasha, Kane, and Ivan. Miles escapes his restraints and murders Sasha by throwing a glass shard into her neck. Latos attacks Miles, biting at his flesh until Vijah shoots him. Kane lunges at Vijah, but Doyle beats Kane off of her and takes Vijah hostage with a fork to her neck as Miles recovers Latos’ gun. Miles ends the standoff by shooting Doyle through Vijah’s stomach. Doyle and Vijah both drop dead. Miles turns to shoot Ivan, but his gun is out of bullets. Miles limps out of town and heads back to the road on foot. In a nondescript wasteland of sun-bleached sand, commodities worth killing for include food, bullets, and especially cars. Out seeking revenge on the man who murdered their father, drifting brothers Dominic and Miles have the last of those three. This makes them a top target for cutthroat thieves aching to waylay the road-weary rogues and hijack their busted-up beater. Dominic and Miles look for a doctor and temporary refuge in a desolate desert town with very few souls in sight. What they discover instead is a small community of cannibalistic crazies who want to use the brothers for food as well as for frightening fun. Rules for survival are constantly changing in this largely lawless world. But the murderous men and women of this roadside hellhole don’t desire to play by any rules at all. The UK DVD release of “Drifter,” which is alternatively titled “Dead End,” touts the movie as “Mad Max” meets “Book of Eli.” The film’s lofty ambitions run even deeper than that. 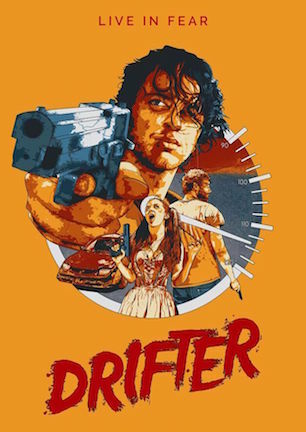 “Drifter” also aims to ape the cannibal craziness of “Texas Chainsaw Massacre” and the psychedelic psychopath style of “Natural Born Killers” as much as it stokes sparks of Tarantino, Rodriguez, and any contemporary crime cinema auteur it can. The problem for production design is that it can’t capture more than an inkling of these influences. As a low-budget indie, “Drifter” prudently keeps scope in check, knowing better than to go full “Road Warrior” with character costumes or envisioning elaborate sets it cannot convincingly create. The tradeoff is that atmosphere doesn’t sell an imaginatively immersive or inventive setting. Actors are outfitted in dirty t-shirts and stained pants as they kick dirt around dusty RVs and bombed-out motor homes. Does “Drifter” actually take place in a post-apocalyptic near future or did the brothers just take the wrong freeway exit to a trailer park outside of Victorville? When the town’s big bad boss lumbers out at an average height wearing simple slacks and a suit vest, it’s impossible to not be underwhelmed by his lack of visual villainy. Then he picks up a baseball bat in preparation of taking it to a hero’s head, making it impossible to not immediately think of “The Walking Dead,” yet another influence “Drifter” partially resembles, albeit without zombies or people worth emotionally investing in. Director Chris von Hoffman employs his music video background to full effect to craft a cinematically competent movie. He paints with a thick brush without sensationalizing to obnoxiously unnecessary extremes. It makes for a distinct look that has aesthetic energy even when the plot’s progression stalls, except that energy doesn’t always fully fit the film. For instance, “Drifter” includes the kinds of shots where its camera cuts to a low angle so a cigarette can drop at the lens in slow-motion to a music sting for no essential narrative reason. It’s a classic case of wanting to do something seemingly “cool” for cool’s sake without having a substantial story providing motivation. The script additionally hits a turning point at its midsection that turns out to be a dead end. “Drifter” loses a key player here and with him goes much of the momentum. The final forty minutes slows to a drag as what was once a setup with potential becomes a plain platform for craven killers to highlight how demented they can be in painfully derivative fashion. We’re talking a Harley Quinn-like seductress who barks like a dog so we can be clear she is crazy, an unflinching enemy who postures by slow clapping, and his group of henchman proving warped weirdness by watching cartoons on a TV whose antenna is a severed head. This isn’t chilling. This is clichéd. “Drifter” nakedly borrows from better movies and its casually catching design isn’t nearly enough to burrow out from under a blisteringly bland back half and overall unoriginality. All of the art direction, staging, and scoring begs pairing with complementary parts more befitting their tone. “Drifter” doesn’t have the depth to put those few boons to good use or truly measure up as a thriller in a George Miller vein. February 22, 2017 by Ian Sedensky.